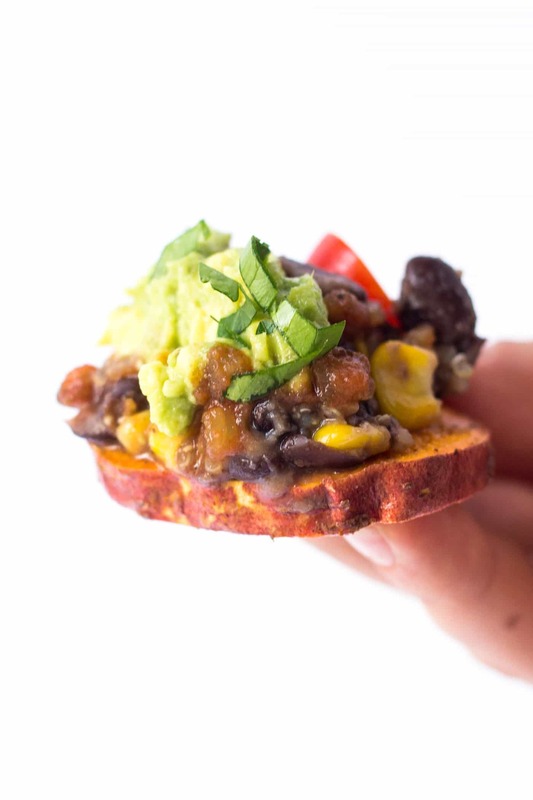 Classic foods remade with a healthy twist = probably one of my fave things ever. We're all about the comforts foods — I mean who isn't, right? — just maybe not in the ways they're traditionally made. You know…fried. floured. buttered. fried again. then dipped in sugar. Tasty sure, but pretty much disastrous to your health. So when we can come up with ways to enjoy not-so-healthy meals in a totally healthy way, I'm all in. That's right. NACHOS. 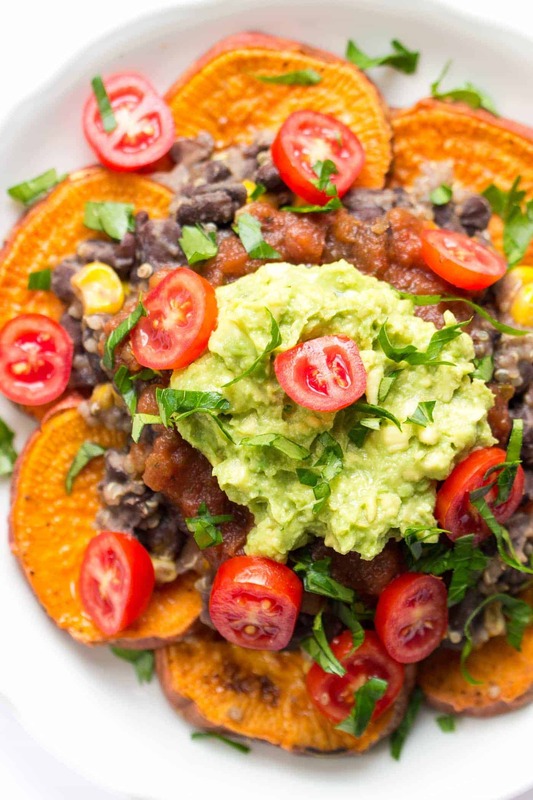 And it's nachos in all caps because hey, it's healthy nachos – hard to beat that! You probably already know what traditional nachos are made with: fried corn tortillas, some sort of shredded meat, loads of cheese and sour cream, then *maybe* topped with some fresh salsa and guac if we're lucky. Not a whole lot of clean eating foods, but dang are they good. 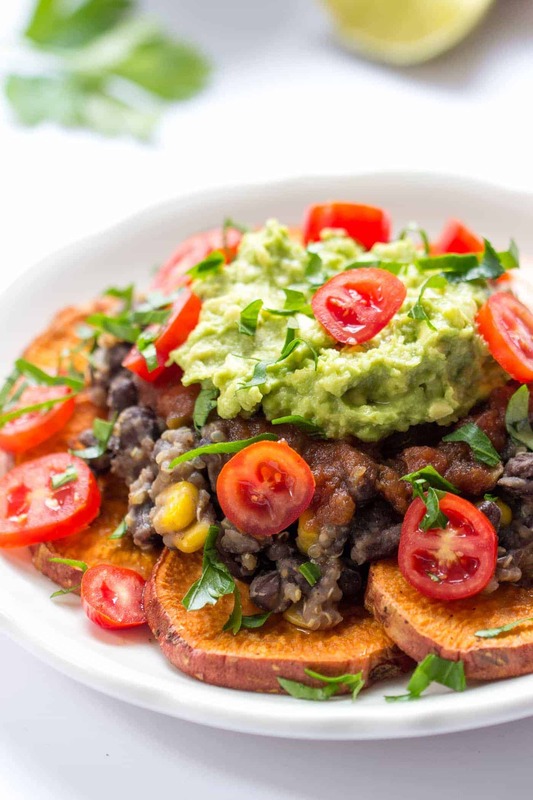 So I looked at what I had…and somehow this concept for sweet potato quinoa nachos just popped into my head. Honestly, it couldn't be a simpler meal to make. We start with the base which is baked sweet potatoes. While I would have looooved to make these with corn tortilla chips, me and corn tortilla chips have quite the tumultuous relationship. I'll demolish a whole bag like it's nothing, so I try to steer clear as much as possible. Then it's onto the toppings. 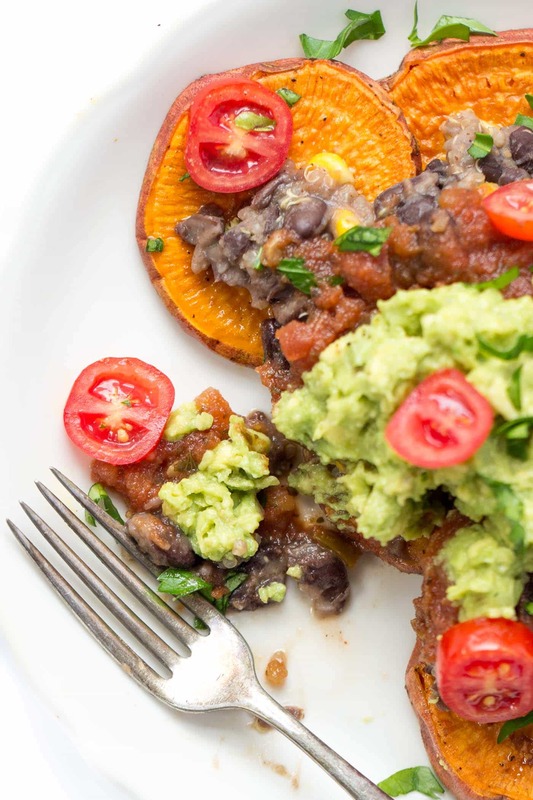 The next layer was black beans because I'm not really eating much meat right anymore, but rather than just trowing them onto the sweet potatoes and calling it a day, I gave them a little more pizzazz. 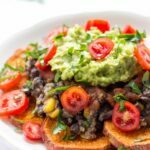 On top of the beans was a layer of organic jarred salsa — any variety you like will do — then some fresh guac, chopped cherry tomatoes, cilantro and a squeeze of lime. My friends, these are epic. They totally satisfying your Mexican comfort food cravings, but in a healthy, non-tummy-ache sort of way. Plus, they're well balanced! 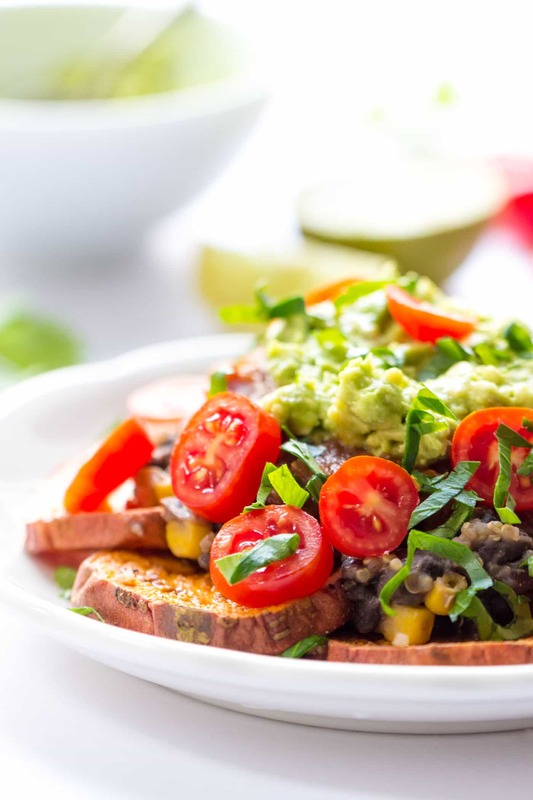 We've got veggies, complex carbs, protein annnnd healthy fats! Now when someone asks you to bring nachos to the party, you know what you're making, right? 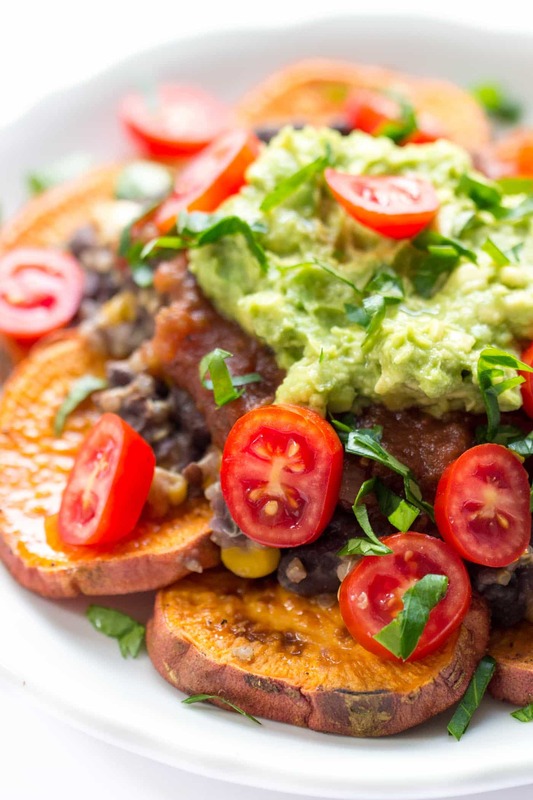 Sweet potato quinoa nachos will win every time. YES! Preheat the oven to 400ºF. Add sweet potato rounds to a large bowl and toss with oil. 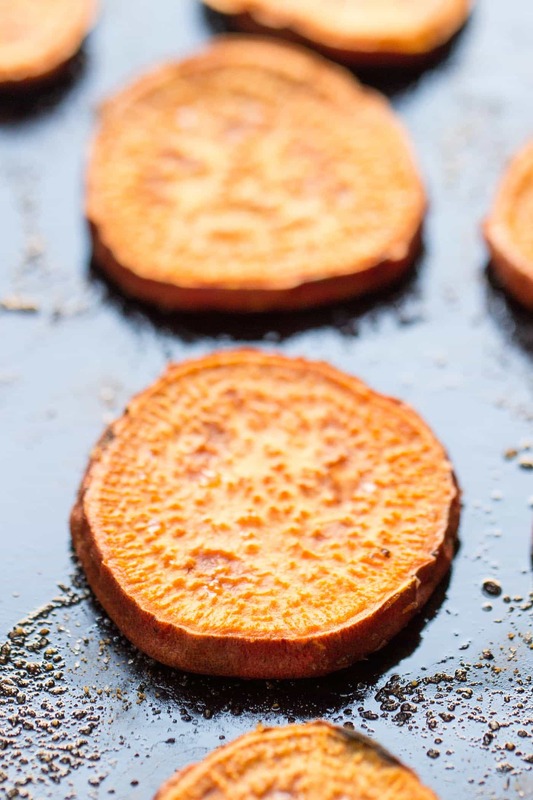 Place onto baking sheets and roast for 25 - 35 minutes until sweet potatoes are soft and starting to brown, making sure to flip them halfway through. 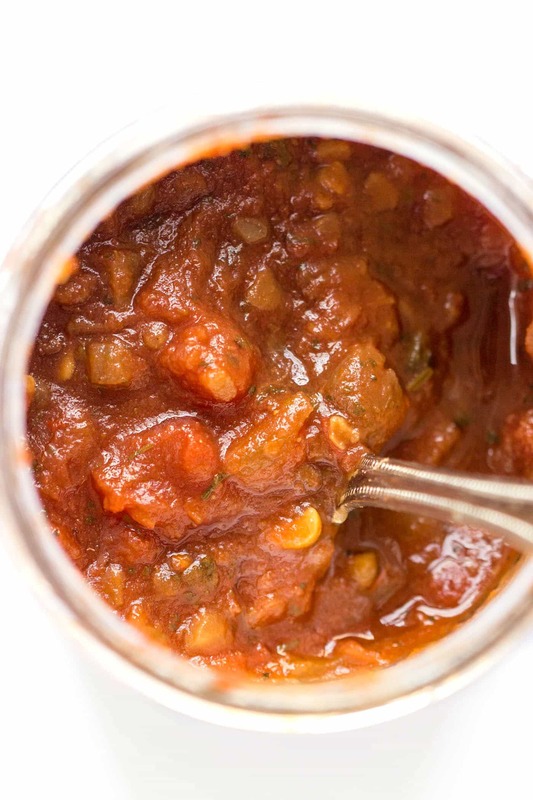 While sweet potatoes are cooking, add beans, water and spices to a small saucepan. Start with 1/4 cup and add more if needed. Bring to a boil then cover and reduce to simmer for 10 - 15 minutes. 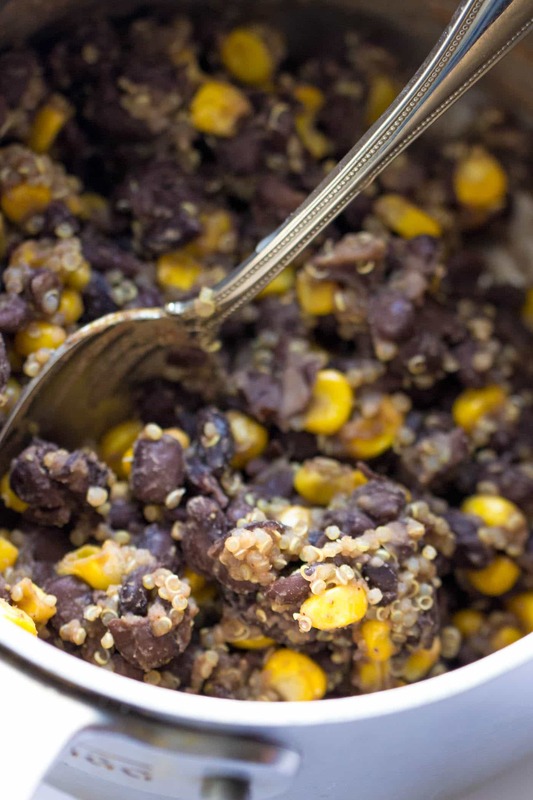 Once beans have softened, stir in quinoa and corn and then remove from the heat. Mash the avocado with the juice of 1/2 the lime and add a dollop onto each helping. Top with cherry tomatoes, cilantro and a squeeze of lime juice. Enjoy! If you use chicken or cheese, follow the instructions through Step 3 and top the salsa with chicken and cheese. Pop the pan back in the oven for 5 - 10 minutes until cheese has browned. OK, I’ve made dozens of recipes from pinterest but this is the first time I’ve felt compelled to comment on one. These were completely delicious! Even without the quinoa (sorry, I didn’t have any). The sweet potato chips were even better than tortilla chips, and the toppings were great. Thanks! That makes me so happy, thank you!!!! Just made these for lunch… amazing! I cut the sweet potato thinner (about 1/8inch) and it worked great since some pieces got a little crunchy giving it more of a nacho feel. I made this tonight. So insanely delicious!! My husband and I thoroughly enjoyed! The only thing we thought we might we might experiment with next time, it cutting the sweet potato a little thinner, but I think it will be too soft. And how you have it, is just perfect!!! Thank you!